Trent said he would also be willing to fully devote himself to Chardo Richardson's challenge of Democratic representative Stephanie Murphy, a challenge that received a shout-out by Ocasio after her win, but he thinks Richardson needs to quit his job to focus on the campaign. "You can't expect people to work tirelessly for you if you don't work tirelessly yourself," he said. "Ocasio put in her time." The Justice Democrats haven't had a big victory until last Tuesday, but they've had good performances—in West Virginia, their candidate Paula Jean Swearengin pulled in 30 percent in her primary challenge of Democrat senator Joe Manchin, an incumbent with a long history in the state. Trent says the Democratic Party is "100 percent to blame for the Trump presidency" and says his group is going to change it. "The Democratic Party desperately needs to change its focus and its priorities—we're working to do that," he said. 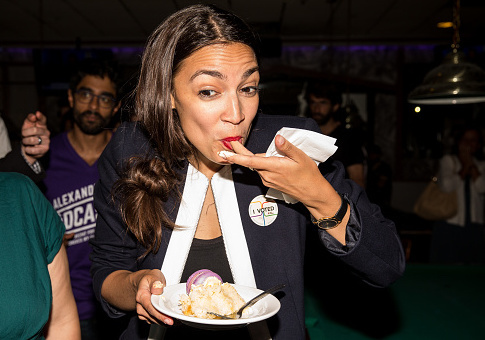 Despite the radical nature of Ocasio's candidacy—last week she accused the government of running "black sites" on the border and has voiced support for violence by Palestinian terrorists, likening it to political activism—Democrats appear poised to embrace her. Crowley quickly voiced support for Ocasio, pledging to work to help her get elected in November. There has also been an increased willingness among top party voices to embrace some of her policy proposals. Sens. Kamala Harris (D., Calif.) and Kirsten Gillibrand (D., N.Y.), both possible 2020 presidential candidates, have gotten behind the push to abolish ICE, which was popularized by the Ocasio campaign. This entry was posted in Politics and tagged Bernie Sanders, Democrats, New York. Bookmark the permalink.